A shower transfer bench is a bathing tool that allows the user to sit on when getting into a bathtub. Possessing a high quality shower transfer bench can be of great use for anyone with balance issues, a disability or even those looking for added support. Shower benches are further divided into two categories, non-sliding and sliding. A non-sliding shower bench is one that has four legs, a backrest, and a long seat. The legs of the bench help provide stability and is available in many different sizes. To use this bench the user usually sits on the seat and then scoots over the seat towards the inside. This type of shower bench comes equipped with additional accessories such as padded seat, armrest and commode opening. On the other hand, a sliding bench is one that doesn’t require the user to move across the seat. All you have to do is simply remain seated on the seat and slide towards the other side. This type of bench is suitable for patients who require assistance. Shower benches serve multiple purposes; their use isn’t restricted to acting as a seat alone. As an added perk, some models of the best shower transfer benches can also double as a storage tool. If you don’t have room to keep your bathroom supplies, use the shower bench and place them on it. Shower benches feature multiple shapes and sizes. They are usually aesthetically appealing and complement the overall look of the bathroom. However, since this case may not apply to all, you have to search for the correct one. Want that spa-like feel at home? You can with shower benches as they allow you to remain seated while you get a steam. Save your money and invest in a shower bench that you can use to create your own spa at home. However, the main reason to invest in a good quality shower bench is, of course, the accessibility that they provide. Shower benches allow you to sit down in the shower area, the purpose is to deliver relaxation. For others, shower benches are a way of support of easily showering. The benches are especially convenient for those in wheelchairs who require assistance. Shower benches make your overall showering experience relaxing. The tool is especially effective for those who are disabled. Shower benches lead to improved safety, reduce chances of falling and put your mind at ease. Falling in bathrooms can do permanent damage to your spine which is why shower benches are handy. Having your very own shower transfer bench will provide you the satisfaction that you can carry it with you wherever you go. Carry it with you when traveling, when using a shower bench at a hotel or anywhere else there are multiple questions that come in the mind such as hygiene. Having your very own will eliminate the need of doubts and worries. As mentioned before, shower benches are especially handy for those with disabilities. With shower benches, they will feel more independent and will not need too much assistance. Some possible drawbacks of a shower bench are that they aren’t as safe as they may seem. Again this depends on the kind of product you buy and where you buy it from. Cost is another setback as the best shower transfer benches can be a bit pricey. 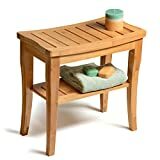 Made using 100% organic bamboos this bench will sort out all your shower needs. Make your shower experience relaxing and enjoyable with this amazing shower bench. The stability of the bench allows you to be seated comfortably without having to worry about anything. If you suffer from severe backaches or have just recently had a surgery done, go for this bench to get the support you require. The bench is made from high-quality bamboo material and holds anti-bacterial qualities. You can also use this bench to keep your shower accessories. It is a waterproof shower bench. The use of this shower transfer bench isn’t restricted only for bathroom purposes but can be used in the garden as well. The measurements of the bench are 19″ inches Long, 10 inches wide & 18″ inches tall. The company even provides a money back guarantee eliminating all doubts regarding the purchase. Customer reviews regarding the product state that the bench is very sturdy and perfect for use in the bathroom. They have added that the bench is nicely designed and well-made which makes it convenient for shower purposes. This popular shower transfer bench is specifically designed for people who need help from others. The use of this item will reduce their dependency allowing them to shower without any worries and concerns. The shower bench is made using molded plastic which ensures stability providing you the guarantee that you won’t fall. The shower bench comes with a backrest to give you a relaxing experience. The dimensions of the seat are 18.5-19.5″ (D) x 26″(W) x 17.5-22.5″(H). The weight of the product is 10 pounds and the item includes a pinch-free lever for safety installation purposes. Another additional feature of this seat is that it can be adjusted according to need. The primary material used in the making of this item is aluminum. This seat is a must have for all those who have disabilities and don’t want to rely on someone’s assistance. Customers who have purchased this shower transfer bench have labeled it as an excellent product. They have stated that the item was easy to assemble and very handy for the elderly. They have further added that the item has a perfect size and is very strong. This bestselling shower transfer bench also doubles as a shower chair. 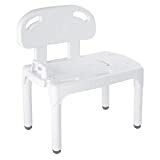 This is a very easy to use and comfortable chair that can easily be transferred in and out of the tub. The sliding doesn’t require any effort and overall it is a strong product. The company responsible for the making of this product is known for providing different types of items in hospitals and nursing homes. 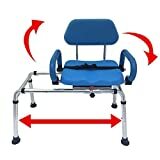 This transfer bench is convenient, comfortable and safe. The bench comes with a padded seat, armrest and a back. Unlike other benches this one isn’t slippery and doesn’t contain hard plastic. Other additional features of this shower bench include its strong ability to absorb water. It is very easy to assemble and clean. This bench doesn’t contain the fixed seat but comes with a swivel seat. The armrests can be raised and locked. The robust armrests can double as leverage points allowing the user to easily move in and out of the bench. Customers who have purchased the item have mentioned in their reviews how convenient the product was for their old age parents. They have further mentioned that the product is worth the investment and easy to assemble. This shower bench by Carex health brand is among top sellers on Amazon. The features of this item include adjustable legs; two handled backrest and can carry up to 400 pounds of weight. The bench is easy to assemble as well as disassemble. It can be easily carried around and stored. The bench has a compact size and doesn’t contain any metal parts. It can easily fit into bathtubs and is very easy to use. The seat of the bench is very comfortable and the built-in handles make the positioning easier. Overall it is a sturdy and compact product. The company has been manufacturing this type of equipment for over twenty years with the main purpose of aiding all those who are dependent on others. Customers who have used this shower transfer bench have stated that it was especially useful for those who had just had a surgery done. They have also stated that the item is much better than other similar shower chairs. The bench is very sturdy and can support the weight of a healthy and obese person. Overall it is a stable and good tool that can improve the overall quality of life. This amazing product by Medmobile is specifically designed for those who are disabled. The transfer bench comes with a 24″ X 15″ allowing easy transfer from the wheelchair to the seat. You can adjust the item height according to need. Get this shower transfer bench to end your bathing difficulties and become self-sufficient. A backseat can also be installed but the choice is optional. The overall dimensions of the item are 29″(L) X 16″(D) X 25″(H). You can use the bench for other purposes as well such as to store items. This bench can be of great use to those who rely on others to provide them support. With this bench, they no longer need support from anyone else and can manage such activities on their own. Customers who have used this bench have stated in their reviews that it is a sturdy bench. Overall the product is very strong and of great use. They have added that the bench is sturdy and slide proof. Customers have also appreciated the structure and making of the product. This shower transfer bench is reasonably priced and can effectively meet the needs of the customer. This transfer bench comes with an unconditional lifetime guarantee allowing you to purchase it without any doubts. It is an overall safe product to use that can support up to 300 pounds and provides users the opportunity to operate without assistance. It is an easy to use and easy to install product that hardly takes 10 minutes to assemble. The versatile design of the bench allows it to be used without any complications. It is an overall lightweight and durable bench that comes with an arm as well as a backrest. This bench doesn’t corrode; the frame and platform seat can be cleaned easily. The bench has a comfortable seating allowing you to relax every time you go to shower. The suction cup caps ensure that the bench remains sturdy and stable and prevent it from slipping. Also, the seat comes with drainage holes in order to prevent water from collecting on the seat. 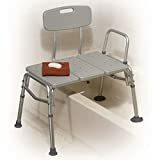 Customer reviews regarding this shower transfer bench state that it is the perfect product for all those with mobility issues. It is a sturdy and safe item that will help cater to all your requirements. Customers have also added that despite being inexpensive, this is a great product that works well. These are some of the top selling shower transfer benches on Amazon. You can choose one that fits into your bathtub or shower with features that you feel most comfortable with.